It’s even in our name – the balance of Modern and Classic. It’s something that drives everything we do. For example, we believe a handwritten note fits in perfectly within the most cutting edge digital strategy. Within design we strive to find that perfect balance between beauty and strategy. At MODassic we don’t outsource and therefore our entire team is full-time and in-house. We’re big believers in collaboration and the idea that we’re better together. We believe the best ideas can come from anyone and that the work is better when it’s done together instead of everyone being remote and simply working off a task list. At the same time we’re huge believers in the idea of travel and getting out of your normal routine – and that means getting out of the office. Not just for your personal well being but we believe it actually makes you better at your job. The more of the world you see the more creative you will be. Even though we have access to the entire world through the internet, you can only be inspired so much when you’re sitting in traffic and at a desk every day. We wanted to find a way that employees could remain collaborative and in-house but could also get out of the office, recharge and get inspired – and not just by using their two week a year of personal time. Travel can be expensive and we want everyone to be able to get out of town but at the same time not have to use their vacation days, not have to take unpaid days off of work and not have to pay for hotels. In late 2017 MODassic purchased a historic railroad loft in the Creative District of downtown Salida, Colorado. With the outpost our employees and partners at anytime can go work from Salida. Employees can work from the large deck overlooking the mountains, at Riverside park overlooking the river, or at one of the many coffee shops and sidewalk cafes. When they’re done working for the day, there’s an unlimited number of adventures just waiting for them. We chose downtown Salida, CO for a number of reasons. Whether you’re an outdoor enthusiast or not, there is something for everyone. 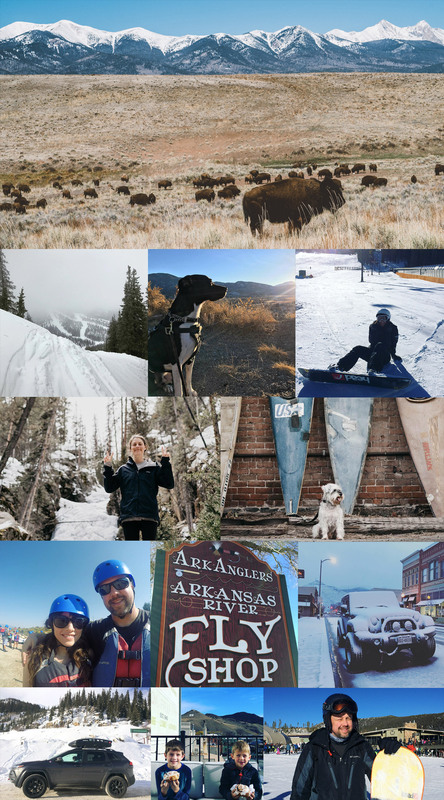 For the outdoor enthusiast, there is access to millions of acres of public land and trails, some of the best fly-fishing, rafting and mountain biking in the country, and just minutes from skiing and snowboarding at Monarch Mountain. At the same time for those who just want to relax, the Outpost is right in the heart of downtown Salida creative district so there are a ton of great shops, artist galleries, coffee shops and restaurants. Because it’s a small town that is a good distance from an Interstate or airport, there aren’t large employers there just employing everyone. This attracts individuals who are creative and entrepreneurial with shared values for the arts and outdoors. This spirit can be found in the character, architecture, food, conversation and friendliness of the community. The weather in Salida is amazing. On the same day you could go skiing in the mountains or be down in the town wearing short sleeves and strolling the galleries, walking along river or just relaxing on the patio. It’s exciting to have a place to escape the 100 degree Texas summers. It’s beautiful year round. We’re big history buffs and especially when it comes to urban planning and city branding which is why we launched CivicBrand in 2014. The MODassic Outpost is rich with history as the building was built in 1900 and was used to house railroad workers in its early years. The original lift is still in place and is now a stairwell. Salida’s history is closely tied to the railroad expansion out west and there’s a good amount of city branding history in Salida, as well. In the 1930’s Wilbur Foshey implemented the “Follow The Hearts to Salida” campaign which blanketed much of the country covering over 4,000 miles in all directions with the famous yellow heart signs. They even came up with the legend that fur-bearing trout had begun to grow, and Governor Ralph Carr made the trip to Salida to examine it in person. Salida was a leader in creative city marketing. In just the few short months that we’ve had the MODassic Outpost, every employee has been able to make a trip up to Salida. We’ve enjoyed their photos and stories and are excited about all of the future trips, getaways and inspired work!